Bitcoin Crypto Currencies Crash 2018, Are We Near the Bottom? As for what bitcoin could do during 2018, well the price may have recovered by some 30% from the recent $10k low but I doubt that the decline is over, so it looks like bitcoin holders are currently in the calm before the next Bitcoin storm, another down leg to well below $10k, probably a spike down to $5k! Following which I would expect Bitcoin to be pretty much dead for the rest of the year, i.e. don't expect a return to $20k anytime soon! 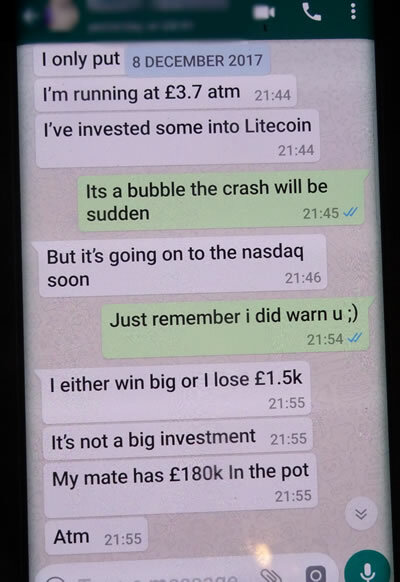 So Bitcoin gamblers beware! The bitcoin price has traded down from the start of the years $14,000, plunging to today's current level of $8,100. That's a 42% collapse in price since the start of the year! And a 60% wipeout since Mid December's $20,000 peak, when I was busy warning to whomever asked that it's going to CRASH! Unfortunately those caught up in the crypto mania are still unlikely to listen to reason and thus likely remain fixated on first revisiting the Mid December high of $20k as a stop gap for a vapour fuelled rise to $50k, then $100k and I have even seen BTC $1 million bandied about. None of which is going happen, and definitely not for 2018! So what does the chart say for the prospects for Bitcoin, well the declines momentum has fallen slightly which suggests that the rate of decent should gradually become milder. 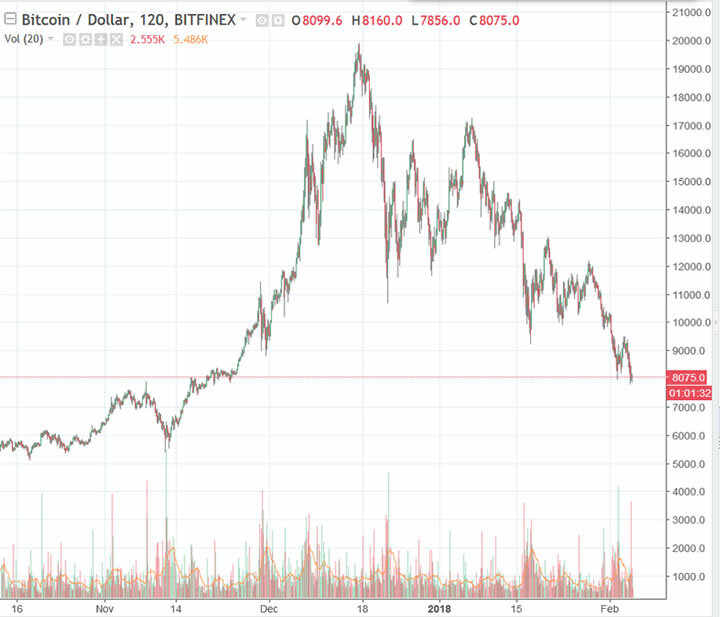 However, the downwards trend / collapse remains in progress so there has been little deviation against my forecast to date which means Bitcoin remains heading for a spike down to $5,000 this year. With the trend channel suggesting that the $5k target may even be reached later this month or early March! So the pain for bitcoiners and the rest of the crypto-crowd is not over! 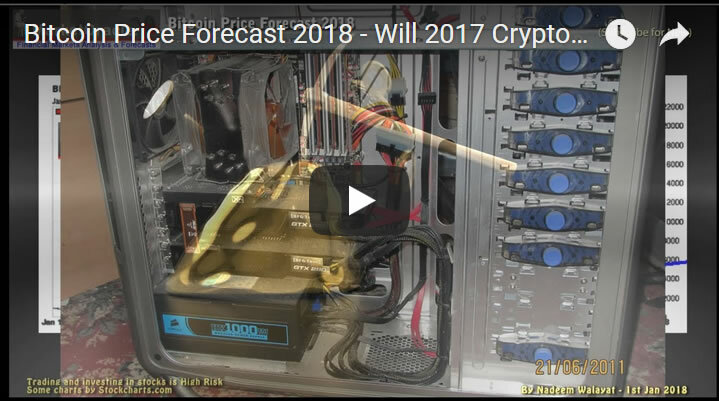 As for what happens after $5k is achieved, well again referring to my original forecast for 2018, I expected that once Bitcoin hits bottom that it will likely be DEAD for the rest of the year. So don't get your hopes up of buying bitcoin at or near $5k and then riding a fantasy rally all the way back to $20k and beyond. It's just not going to happen. IN FACT, given the speed dissent to $5k and the clear persistence of bullish bitcoin fever in the market place then that may not be enough pain to dissipate bullish mania sentiment. So despite $5k remaining my 'technical' forecast target. I know bitcoiners will hate to hear more bad news but the Bitcoin price could slice through my $5k target and just keep falling to the next support of $3k! That would be a further 40% COLLAPSE FROM $5k which is why I am warning not to buy at $5k as that chart does not look like it wants to make a bottom anytime soon. I know some are now wondering, well shall I buy at $3k then? WELL if bitcoin slices through that as well then we will be at $2k, which means you've just lost 33% of the value of Bitcoins bought at $3k! 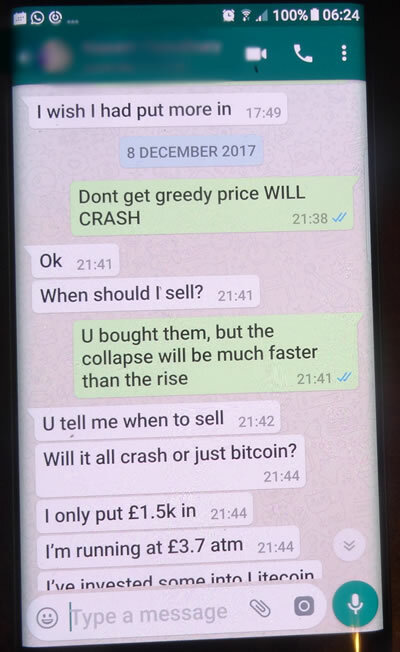 This market is definitely not for the novices which is what most bitcoin players are! And ensure you are subscribed to my always free newsletter and youtube channel for my forthcoming in-depth analysis and detailed trend forecasts.